Born: Vienna, Austria, 12 January 1910. Family: Married 1) the playwright Clifford Odets, 1937 (divorced 1940); 2) Robert Knittel, 1945 (died 1989), one daughter. Career: Actress from childhood in Vienna and Berlin; acted in Max Reinhardt's Vienna theater ensemble in plays by Pirandello, Shakespeare, and many others; 1930—film debut in Ja, der Himmel über Wien ; 1935–38—contract with MGM; U.S. film debut in Escapade , followed by two successive Oscar-winning roles in The Great Ziegfeld and The Good Earth ; 1943—"comeback" film Hostages ; some later stage and television work; 1978—paintings exhibited at Seale Gallery, London; 1981 and 1983—toured the United States in Enoch Arden , music by Strauss. Awards: Best Actress Academy Award, and Best Actress, New York Film Critics, for The Great Ziegfeld , 1936; Best Actress Academy Award, for The Good Earth , 1937. Address: 54 Eaton Square, London SW1W 9BE, England. Luise Rainer's career withered under the curse of the Oscar, of two Oscars in fact. Reminiscent of Elisabeth Bergner, an exponent of the laughter and tears school of acting, Rainer made an immediate impact with her hyperemotional style. Showing her changing moods with an arsenal of vocal and facial expressions, eyes darting, hands fluttering, Rainer's nervous energy was distinctively European, but also dissimilar to the slower rhythms of Garbo and Dietrich, the reigning European actresses in Hollywood. Portraying Anna Held, a less-thanstarring role in the musical extravaganza The Great Ziegfeld , Rainer so impressed audiences with one highly emotional scene that she was rewarded with an Oscar. Her Anna is speaking on the phone to her ex-husband, Flo Ziegfeld. Still in love with him, she gallantly congratulates him on his marriage to Billie Burke. The camera records her agitation; Ziegfeld hears a voice that hovers between false gaiety and despair; when she hangs up she dissolves into tears. In her next film, The Good Earth , Rainer played a role meant to be diametrically opposed to the vivacious Anna Held. 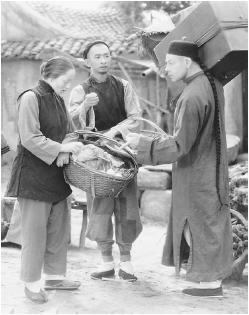 Here she portrayed a humble Chinese peasant, utterly subservient to her husband, perpetually huddled in submission, barely speaking a word of dialogue or raising her eyes to the camera. The contrast (and perhaps MGM's strength among Academy members) allowed her to win her second Oscar in successive years. At this point, Hollywood turned its back on Luise Rainer just as abruptly as it had celebrated her. Having gained the reputation of being "difficult," she was cast in a few unimportant or disappointing films, her whole Hollywood career having lasted three years (with the exception of Hostages , produced during World War II). Adding to her decline was the poor career advice given her by then-husband Clifford Odets. Her record of two successive Oscars stood, however, until Katharine Hepburn equaled it in 1967 and 1968. Rainer came back to Hollywood in the early 1980s, and even appeared on an episode of television's The Love Boat . And in 1988 she starred in A Dancer , a 28-minute-long dramatic piece directed by independent video artist Doris Chase. Her role was that of an exdancer who currently teaches, choreographs, and runs her own ballet school, and who is reunited with a former lover after a 30-year separation. Rainer's mature, carefully crafted performance offers evidence that, had her career been charted on a different course, she might have flourished as a screen star.